For the first in installment in what will hopefully be a long and prosperous series of guest blogs Gus Routledge (@PinkfootedGus) talks about his inspiration, motivation and how he ended up where he is today. Gus is a birder and botanist currently studying on a countryside management course and is someone I have been familiar with on social media for a long time. The below piece is rather good in my opinion and showcases many parallels to my own life and no doubt those of many other young naturalists . Enjoy and if you feel inspired to share your story feel free to drop me a message. Being my age and as into conservation and the countryside as I am is widely known as being slightly unusual. In fact I think a lot of the stuff I do is regarded as slightly unusual: going out at midnight to look for a Pine Marten that is going to be very difficult to look for, hiking up into the uplands at New Year in order to see if there are any flowering plants, collecting moss at the side of the road, you get the picture. This passion has clearly had to have come from somewhere. Where to start though… Well, as ever, I think the beginning is probably best. When I was wee my parents used to take me on walks in the Royal Botanical Gardens of Edinburgh. I’d feed the ducks, enjoy walking along logs, hide in bushes, and sit in the daffodils. There’s a video of me in Mallorca on holiday, when I was just a toddler, observing the ants and watching them go down their wee hole, carrying crumbs and such down it. In fact, now that I think about it, I was doing exactly the same thing last year when we were in Mallorca. This is why I think it’s important that children are exposed to nature. Even if they aren’t as inspired as I am, it will hopefully make them more aware of the natural world as adults, and therefore they will perhaps be more ready to protect it. On top of all the walks and being outdoors, my gran played a big part in getting me interested in wildlife. This was primarily through introducing me to bird watching. She gave me my first ever field guide; Collins Photoguide of Britain and Ireland. She took me to my first nature reserve; Vane Farm (now RSPB Loch Leven) where I watched my first Chaffinches feeding on the feeder; and she still encourages me to pursue my career now! I don’t think I would have quite managed to get to where I am now without the inspiration my gran provided for me, whether I was 4 years old or 18 years old. From toddler to about my first year in senior school I always wanted to be in the countryside or managing wildlife or animals, whether this was as a vet, a farmer, a gamekeeper or a zoo keeper. For some strange reason, my interest in all things natural disappeared once I started senior school. Maybe the fact I was suddenly a teenager and such things weren’t cool, I don’t know. What I do know is that half way through fifth year I decided to watch Springwatch for old times sake and my passion was completely reignited! The only problem being that I had selected subjects in school that would help me become an engineer… Not ideal. Towards the end of fifth year we have a work placement week. I was lucky enough to work with the Scottish Natural Heritage rangers at Loch Leven for the week, living with my gran who would give me lifts through to Kinross each day. That was probably one of the best weeks of my life. Sunny all week, doing brood counts, getting many lifers, fixing fences, digging drainage ditches, it was bliss. And that was it, I realized that was what I wanted to do. Sixth year was really a year of setting things back to how they once were, getting back into bird watching, doing subjects that would hopefully help me get back into an outdoor career, and generally just becoming more and more enthralled in wildlife, appreciating it more since I was older and able to understand far more. 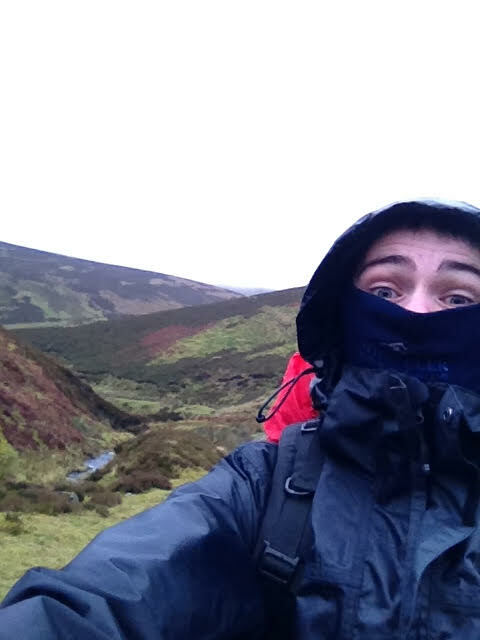 Completing my John Muir Award in Holyrood Park with the help of the Historic Scotland Rangers got me outdoors every week, pushed me to learn about new things, and I got my John Muir Award at the end of it of course! Plus my biology teacher certainly helped me realise my potential to get to where I wanted to be, so where am I now? I’m now at the Aberdeen campus of Scotland’s Rural College (used to be Scotland’s Agricultural College but not anymore!) studying Countryside Management. I actually came up here for an applicant day and one of the lecturers said something to me which pushed me over to the ecologist/ranger sort of career. After telling her that I could identify birds she told me that, “birds are good, but to really stand out to an employer you need to be capable of identifying things that others can’t.” Hence all my various tweets on mosses, flowers, trees, lichens, fungi, spiders, and still some on birds! This course is perfect for me. We have plenty of opportunities to get some hands-on learning through field trips, voluntary work and wee experiments in class. There hasn’t been a module that I haven’t enjoyed (except IT, ugh) despite the fact they have been quite diverse, e.g. History and Archaeology, Biodiversity Conservation, Recreation and Access, and Rural Land Use in Scotland. All the lecturers are keen to push me in the right direction and the same goes for my course mates. They all have shared interests with me and it’s great being able to talk about things that interest me with people my age who are equally interested. In fact, going back to that mention of Twitter, I’ve actually found a lot of inspiration from the people who’ve helped me online. So I have to thank you guys for that! The internet is a great tool for learning things and meeting people with the same desire to conserve the countryside and wildlife that we have in the UK and around the world (as infuriating as it may be when it doesn’t work)! Finally, something that I couldn’t go without mentioning as a source of inspiration. As corny and cheesy and cliché as it may sound, that natural world is so huge, unexplored and unknown that it’s got to be the main thing that made me want to learn about and conserve it.